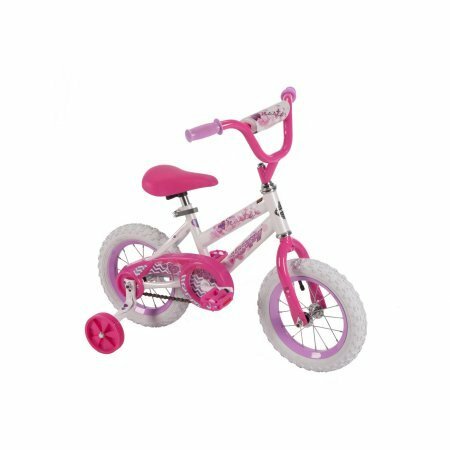 Your little girl will love riding down the sidewalk on the Huffy Sea Star bike decorated with pretty colors and fun, whimsical hearts. The pearl white frame is the perfect contrast for the hot pink and lavender featured handlebars, seat, chain guard and rims. It's easy to adjust the decorated padded seat to the right height as kids grow with the alloy quick adjust - just open, adjust and close to secure back in place. The single-speed bike has an easy-to-use coaster brake. The coaster brake is easy to ride and the wide training wheels designed for sturdy sidewalk use. Huffy bikes are all about fun - go for it.